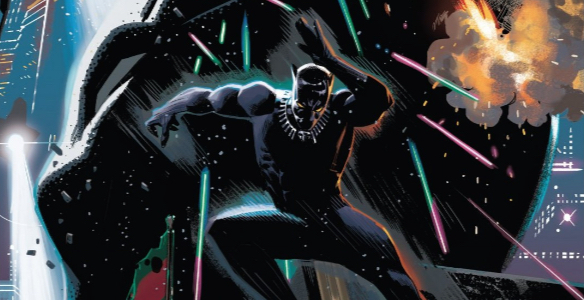 With this new volume of Black Panther, writer Ta-Nehisi Coates has thrown readers into the deep end of his story, giving us no clue how T’Challa came to be abducted by the Intergalactic Empire of Wakanda, and very little reassurance that the T’Challa we’re following even is the same T’Challa from Coates’ previous volume. It’s a fun little mystery, and one where the fact that neither readers nor T’Challa know any answers has immense thematic parallels, but also one that really just hovers around the margins of Black Panther 2. 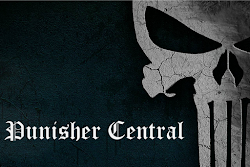 Even as the mystery grows greater, this issue is an action spotlight, a car chase first and foremost. That’s not entirely a bad thing, as artist Daniel Acuna makes that action look damn good. Between motion lines and effect blurs there’s real speed evident in each and every panel, and Acuna (and letterer Joe Sabino) makes smart use of color to not only help emphasize the speed, but to differentiate the various factions of ships and their pilots. Color and effects actually play a vital role in every single aspect of this issue; the writhing, otherworldly black of Lord N’Jadaka’s cape, for example, really sells him as a terror and an enemy worth being afraid of. Ultimately, though, the focus on action and spectacle leaves Black Panther 2 feeling slight. The thematic material that left issue 1 feeling like such a revelation is largely missing, and the character work is almost non-existent; all we learn about T’Challa is that he’s supernaturally skilled and that he hasn’t fully come to rely on his teammates yet. The first point was already obvious from issue one, while the latter point feels like it’s coming way too late in the character’s history — he’s already been working with the Maroons for two years at this point, making this is a lesson he should have learned long ago. You can learn a lot about the characters if you look to the supplemental material in the back, but that feels like cheating; if we’re going to get to know these characters, Coates and Acuna should make room for that within the actual text of the issue. 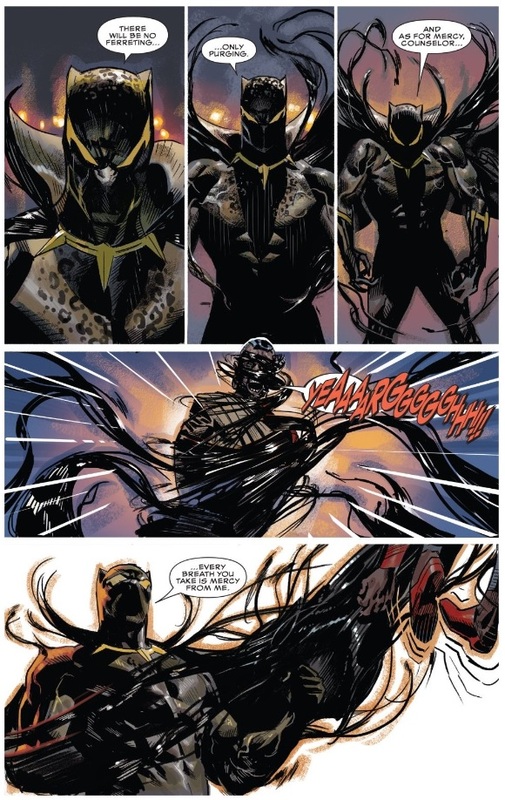 What I ultimately find most interesting about Black Panther 2 are those bits of mystery hovering around the margin, like, yes, the fact that the issue skips ahead two years in the future. If this is our T’Challa, what does it mean that he’s been gone from home for so long? Is there time travel involved, or perhaps even alternate universes? The M’Kraan Shard the Maroons liberate in this issue, after all, does tap into interdimensional power, making me wonder if perhaps this isn’t our T’Challa at all, but one from an alternate universe? I trust we’ll get to this all in due time, but in the meantime I wish a bit more about this issue really captured my attention. I actually liked this issue for the amount of action. If this is supposed to be about giving a black perspective on Space Opera and Star Wars, then you need you Space Opera action scenes. Creating an equivalent to… well any of the action scenes in A New Hope is the value. Space Opera and Star Wars owe a lot to the stories from oppressed groups, and so this acts as a reclaiming of that ground. This is how we do it from the perspective of a black man who is actually impacted by it. In part, itnis the revolutionary idea of just letting the character do what every other Space Opera character does. Black Men usually don’t get to be the heroes in this sort of scene. Even Finn is second to Rey. Though there is deeper meaning. Largely the way that the Heart Shaped Herb subtly plays the role of the Force here. T’Challa’s powers of being the Black Panther are centred, and in doing so showing that even in an action sequence, the idea of Black Panther as a meme and all that stuff I said last issue applies here. Despite everything the Empire tried to do, they cannot truly steal his identity. Even after stripping his mind of everything, He is still Black Panther, with everything that means. I’m a little disappointed with the reveal of N’Jadaka, largely as I was really hoping it would be Kilmonger and not a namesake. But while there are Kilmonger signifiers on N’Jadaka, namely the leopard print (representing Killmonger’s pet leopard Preyy) and the gold Black Panther necklace from the movie, his physique is all wrong and he doesn’t have the most important visual element, Killmonger’s distinctive necklace. Shame. Comics Killmonger would be the perfect villain for this story. Still, even if this isn’t the N’Jadaka I wanted, he looks like a great villain going forward. That line about mercy is perfect for a villain all about slave and the subjugation of lives.